Filed to: Pizza time!Filed to: Pizza time! The eels have always been waiting for the pizza to arrive, but they have never been patient about it. They chitter wetly in the brackish water, anticipating the moment when at last they will be fed, and here it comes! An 8-inch oven pizza tossed into their midst. They sink their rows of jagged, needle-like teeth into it, but that is the least of the pizza’s worries. Imagine a journey down that digestive tract. 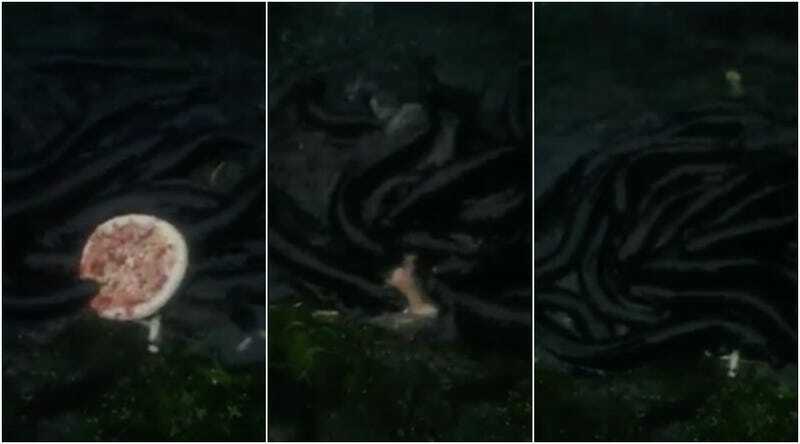 The hardest part of the video to watch is the way the eel on the far left first drags the pizza inward, then chomps all the way through it and into the other side of the eel-pile. The second hardest part of the video to watch is the end, when the pizza is gone, and you can just see the eels swarming over one another. They are hungry! The eel video is not new. It has been around since at least June 2018, when it appeared, in even longer and more terrifying form, on Reddit. You can watch it there. You can watch most things there; it’s Reddit. And yet the video of eels eating pizza is back, because there is a new tweet about it, and it is lunchtime on the internet, where there is always the promise of a new pizza being tossed into the lake. Let’s say you are an eel: Are you not going to eat the free pizza? When you watch the eel video enough times, though, it actually starts to feel sad. Think of all those eels who didn’t get a single bite of pizza!